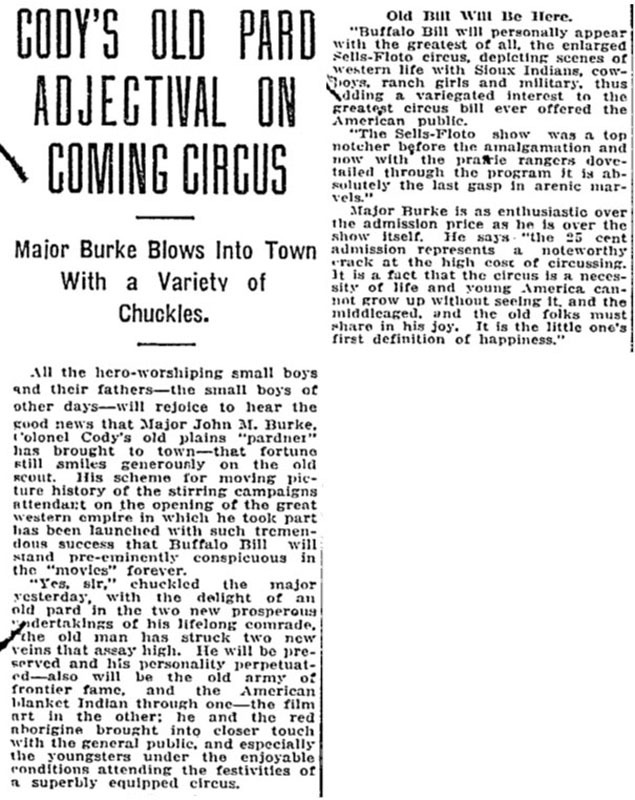 Major Burke Blows Into Town With a Variety of Chuckles. All the hero-worshiping small boys and their fathers — the small boys of other days — will rejoice to hear the good news that Major John M. Burke, Colonel Cody's old plains "pardner" has brought to town — that fortune still smiles generously on the old scout. His scheme for moving picture history of the stirring campaigns attendant on the opening of the great western empire in which he took part has been launched with such tremendous success that Buffalo Bill will stand pre-eminently conspicuous in the "movies" forever. "Yes, sir," chuckled the major yesterday, with the delight of an old pard in the two new prosperous undertakings of his lifelong comrade, "the old man has struck two new veins that assay high. He will be preserved and his personality perpetuated — also will be the old army of frontier fame, and the American blanket Indian through one — the film art in the other; he and the red aborigine brought into closer touch with the general public, and especially the yougsters under the enjoyable conditions attending the festivities of a superbly equipped circus. Old Bill Will Be Here. "Buffalo Bill will personally appear with the greatest of all, the enlarged Sells-Floto circus, depicting scenes of western life with Sioux Indians, cowboys, ranch girls and military, thus adding a variegated interest to the greatest circus bill ever offered the American public. "The Sells-Floto show was a top notcher before the amalgamation and now with the prairie rangers dove-tailed through the program it is absolutely the last gasp in arenic marvels." 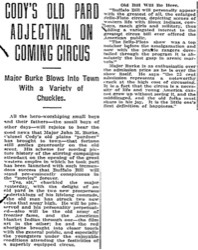 Major Burke is as enthusiastic over the admission price as he is over the show itself. He says "the 25 cent admission represents a noteworthy crack at the high cost of circussing. It is a fact that the circus is a necessity of life and the young America cannot grow up without seeing it, and the middleaged, and the old folks must share in his joy. It is the little one's first definition of happiness."